Airport ''Riga'' is at full capacity, thus the construction of a new terminal cannot be postponed, the Saeima Economic, Agricultural, Environmental and Regional Policy Committee concluded yesterday, after deputies listened to presentations by the management of national airline airBaltic and the airport itself. Airport ''Riga's'' current capacity is 2.5 million passengers per year, however, the airport's passenger volume already exceeded four million passengers last year. The government has already accepted airBaltic's plan to construct a new passenger terminal worth EUR 92 million (LVL 64.4 million), writes LETA. The committee proposed for the Transport Ministry to carry out calculations and assess the profitability of the project for large state enterprises, which would co-finance the project. As reported, airBaltic was established in 1995, its principal shareholders are the state of Latvia with 52.6 percent of the shares and the company Baltijas aviacijas sistemas, owned by the airline's president, Bertolt Flick, with 47.2 percent of the shares. The airline's preliminary profit figures for 2009 was LVL 14 million, with turnover reaching LVL 206.3 million. 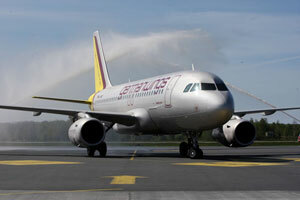 The airline's fleet consists of 31 planes, which carry out direct flights to destinations from the three Baltic capital cities – Riga, Vilnius and Tallinn.